Most working adults look forward to their retirement years with dreams of having limitless leisure time and very few obligations. While this relaxing way of life is true for some seniors, the reality of retirement often includes less interaction with friends and family and fewer outings and activities, which can lead to feelings of loneliness, despair and lack of purpose. As a trusted Toronto home care agency, it is our mission to ensure that a senior’s needs are met, not only physically but emotionally as well. Our highly trained and compassionate caregivers provide companionship to seniors to help combat loneliness and depression, but also understand the importance of building a strong emotional support system for their clients in all aspects of life. One great way to do that is through pet ownership. The following are just a few of the benefits that seniors can enjoy when caring for a furry friend. 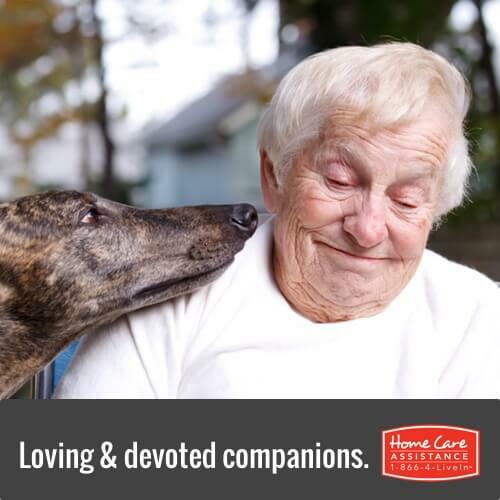 Companionship – Adopting a loving pet creates a bonding experience that benefits both the older adult and the animal. A senior is able to show love and affection to an animal that can reciprocate those feelings, often helping him or her feel that they have a friend or companion to turn to at all times. A Sense of Purpose – Sometimes older adults who are no longer tied to work and other commitments lose their daily routine and find themselves moving from day to day with little or no sense of purpose. Caring for an animal involves performing specific, important tasks that can help re-establish a healthy living pattern for seniors and makes them realize that they are needed. Cognitive Functioning – A recent study on the effects of pet ownership on older adults observed that seniors in the beginning stages of dementia exhibited better memory recollection when they were given a pet and that they focused less on their ailments. Elderly people with pets are also more likely to engage their minds by reading up on their specific animal’s breed and stimulating their brains while they’re involved in research. Health Benefits – Research continually shows that seniors who adopt and care for pets have lower levels of stress and blood pressure, and experience decreased incidences of anxiety and depression. Additionally, older adults who have dogs generally get more exercise during the day because they take their pets out for regular strolls and play with them. Before adopting a pet, it’s also important for families to consider their loved one’s current abilities to see if pet ownership is a viable option. Also, the breed of the animal should be considered, as well as it’s size, activity requirements and the cost of pet care such as veterinarian visits and food. If you have an aging parent or loved one who is living alone, but you’re not sure if pet ownership is the right choice, provide him or her with the companionship of a friendly in-home caregiver from Home Care Assistance of Toronto. Our caregivers are highly trained and can accompany your loved one to local outings, while also assisting with in-home activities and daily tasks. Learn more about hourly or live-in Toronto caregivers by calling 416-488-8777 and scheduling a complimentary, no-obligation consultation with an experienced Care Manager.